Alex R. Knodell is Assistant Professor of Classics and Co-Director of the Archaeology Program at Carleton College. He currently co-directs the Mazi Archaeological Project (Northwest Attica, Greece) and previously served as field director of the Brown University Petra Archaeological Project (Petra, Jordan). Other research interests include the development of complex societies in the Late Bronze Age and Early Iron Age Mediterranean, especially in relation to the Euboean Gulf of Greece. Recent articles have appeared in Antike Kunst, Journal of Archaeological Science, Journal of Field Archaeology, and World Archaeology. Thomas P. Leppard is Renfrew Fellow in the McDonald Institute for Archaeological Research at the University of Cambridge. His research concerns the comparative archaeology of island societies in the Mediterranean, Caribbean, and Pacific, especially issues of colonization, mobility, and emergent social complexity. Recent articles on these subjects have appeared in Human Ecology, Cambridge Archaeological Journal, Current Anthropology, Journal of Island and Coastal Archaeology, Journal of Mediterranean Archaeology, and World Archaeology. He currently conducts fieldwork in Micronesia and Sardinia. This volume considers regional approaches to social complexity from a variety of perspectives and at a global scale. John F. Cherry has been a key figure in regional-scale inquiry and broader disciplinary interfaces throughout his career, producing, mentoring, and inspiring a remarkably diverse body of work, which nevertheless remains oriented around this central theme. While Cherry’s work is the inspiration for this volume and the papers within it, this should not be seen as a traditional festschrift, or piecemeal homage to the honorand’s career. Rather, it aims to explore this core concern of regional approaches to society and complexity in comparative perspective, first in the Aegean, then branching out to the wider Mediterranean, New World, and finally reflecting on relevant issues of concern to all archaeologists working at levels above the site. A. Colin Renfrew (Lord Renfrew of Kaimsthorn) is Disney Professor of Archaeology Emeritus at the University of Cambridge, and former Director of the McDonald Institute for Archaeological Research, where he is currently a Senior Fellow. He is a preeminent figure in world archaeology, known for his work on radiocarbon dating, archaeogenetics, Aegean Prehistory, and his efforts to prevent looting and quell the illegal antiquities trade. His recent publications include The Cambridge World Prehistory (Cambridge, 2013) and a reissue of The Emergence of Civilisation: The Cyclades and Aegean in the Third Millennium BC (Oxbow, 2011, with Foreword by John F. Cherry). 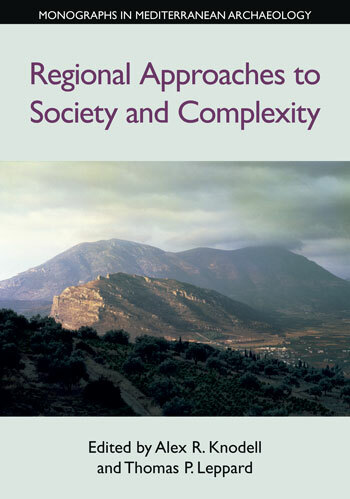 This introductory chapter lays out the framework and key themes of the present volume, explores the development of regional approaches to society and complexity over the last several decades and situates the papers that follow in terms of a comparative agenda. We begin by establishing context through a discussion of critical junctures in the history of regional studies. While taking a deliberately global view, we claim that the Aegean has been an exceptionally fruitful ground for the development of archaeology beyond the site, and that certain Aegean-based developments in archaeological survey and studies of sociopolitical complexity have represented crucial ways forward for comparative archaeology in the later twentieth and early twenty-first century, seen especially through the work of John F. Cherry. Such contributions include specifically the development of meso-scale, explicitly regional perspectives, as well as multi-scalar studies of complex societies that aim to synthesize local, regional, and inter-regional interactions. Nevertheless, disciplinary divisions between Mediterranean and other archaeological traditions remain an impediment to the type of regionally grounded, comparative perspectives advocated in this book. By examining patterns of divergence and convergence in methodological, theoretical, and disciplinary developments we provide a summary and assessment of regional approaches to the archaeological study of society and complexity in the Mediterranean and beyond. Sturt Manning is Goldwin Smith Professor of Classical Archaeology and Chair of the Department of Classics at Cornell University, where he also directs the Cornell Tree Ring Laboratory. His research interests include Aegean, Cypriot, and east Mediterranean archaeology, along with the archaeology of complex societies, dendrochronology, radiocarbon dating, and archaeological science. Recent publications include A Test of Time and A Test of Time Revisited: The Volcano of Thera and the Chronology and History of the Aegean and East Mediterranean in the mid-second Millennium BC (Oxbow, 2014) and Tree-Rings, Kings and Old World Archaeology and Environment: Papers Presented in Honor of Peter Ian Kuniholm (Oxbow, 2009). There has long been debate over both (1) the timescale and analytical approach to the development of the first ‘palaces’ (and state-like civilization) on Crete, and (2) the primacy of internal processes versus external factors in this transformation. John F. Cherry argued forcefully for a critical approach, whereas others have pursued more creative lines often assuming we can fill in or amplify missing or partial evidence. This paper returns to the topic more than three decades after Cherry’s (1983) evolution or revolution scholarly grenade. It reviews the history of scholarship and investigates aspects of the relevant timescale/process, issues of scale/analysis, and the question of the balance between internal versus external causation. John Bennet is Director of the British School at Athens and Professor of Aegean Archaeology at the University of Sheffield. His research interests lie in early writing and administrative systems (especially Linear B), and the integration of material and textual data to understand past complex societies. He has employed this approach to the Minoan and Mycenaean cultures of the Bronze Age Aegean, as well as in the context of diachronic regional studies to the Venetian and Ottoman periods of Greece. His recent publications include: A Historical and Economic Geography of Ottoman Greece: The Southwestern Morea in the Early 18th Century (American School of Classical Studies at Athens, 2005), ΑΘΥΡΜΑΤΑ: Critical Essays on the Archaeology of the Eastern Mediterranean in Honour of E. Susan Sherratt (Archaeopress, 2014), and The Disappearance of Writing Systems: Perspectives on Literacy and Communication (Equinox, 2008), co-edited with John Baines and Stephen Houston. It is widely held in Aegean archaeology that the Minoan and Mycenaean polities of the second millennium BC possessed no ruler iconography and that monumental representational art appears relatively late (around the Middle/Late Bronze Age transition) in the form of wall-paintings. Equally, we tend to accept that the use of writing (and therefore literacy) was restricted. Moreover, writing is never used to ‘anchor’ or ‘caption’ seemingly specific visual scenes to particular contexts, narrative or otherwise, as happens in other societies earlier, contemporary, and later. The author outlines the development of writing in the Aegean (hence Gelb), but does so alongside the development of representational art (hence Gell) with a view to demonstrating that both ‘art’ and ‘writing’ form complementary, not overlapping, aspects of a broader high-status cultural literacy that also encompasses archaeologically intangible practices of performance. Viewed in this way, the author suggests that the absence of captioned images, particularly of rulers, and of life-size or larger three-dimensional representations becomes explicable. Further, with the loss in the years around 1200 BC of the frames within which such performances took place, the continuity of practice that is ultimately embodied in (written versions of) oral poetry from ca. 700 BC appears more comprehensible. Similarly, the deployment of writing in the recently adapted alphabet to give specificity to visual representations reveals a radically different social context for literacy that comes to characterize the Greco-Roman world. Michael L. Galaty is Professor of Anthropology at the University of Michigan, where he is Director and Curator of European and Mediterranean Archaeology at the Museum of Anthropological Archaeology. He conducts field research in Albania and Greece, in Shkodër and Mani respectively, with a focus on the origins of complexity. The final publication of the Shala Valley Project, Light and Shadow: Isolation and Interaction in the Shala Valley of Northern Albania (Cotsen Institute of Archaeology Press, 2013) won the Society for American Archaeology’s 2014 Book Award. This paper employs the prestige-goods network in modern highland northern Albania — focusing on interactions between local ‘tribal’ groups and the Ottoman empire — as a comparative analogy for investigating the trade in prestige goods between Minoan and Mycenaean Greece and Egypt. Various goods were acquired by Albanian mountaineers in Ottoman market towns and shared within and between households. Exchanges of such goods were governed by customary laws related to reciprocal hospitality and honor (nder). Thus there was an ideological component to the trade in and use of prestige goods, but the symbolic meanings they held in Ottoman culture were not necessarily those they held in Albanian tribal culture. Ottoman authorities allowed, even encouraged, mountain trade, but the independent Albanian state, in its effort to destroy the mountain tribes and their chieftains, closed borders, restricting access to market towns, and thereby disrupted the prestige-goods economy. Without access to prestige goods, systems of reciprocal hospitality (and therefore economy) faltered. The role of prestige-goods in the operation and then collapse of tribal social systems was not techno-functional; it was ideological, framed in emic terms by mountaineers as a failure of honor. This paper suggests, based on a contextual analysis of Egyptian items imported to Late Bronze Age Greece, that Mycenaean (but not Minoan) society may have relied on ideological systems that were similar to those of the modern Albanian tribes. This paper highlights the importance of analogy to the study of prehistoric states. William A. Parkinson is Associate Curator of Eurasian Anthropology at the Field Museum of Natural History and Adjunct Associate Professor of Anthropology at the University of Illinois at Chicago. He co-directs the Körös Regional Archaeological Project in Hungary and The Diros Project in Greece. European archaeology is historically schizophrenic. Grand syntheses of the entire continent are created through the narrow perspective offered through the excavation of individual sites. While such macro-scale syntheses are essential for the discipline of archaeology, they need to be tethered to specific regional and micro-regional studies. This chapter builds upon two themes that pervade John Cherry’s many contributions to archaeology: regional-scale studies and the development of complex economic and political systems. By comparing and contrasting regional studies in two distantly related parts of the European continent — the Carpathian Basin and the Aegean — the author discusses the long history of systematic, intensive, regional studies and how earlier survey projects have facilitated the more recent, micro-regional studies that incorporate the cutting-edge research techniques that only recently have become available. The integration of these micro-regional datasets is the new frontier for regional studies. Bradley M. Sekedat is a Lecturer at the University of California, Davis. His research explores survey methodology and industrial practices in the eastern Roman empire. He is Assistant Director for Survey of the Central Lydia Archaeological Project. Recent articles have appeared in the Journal of Roman Archaeology and Archaeolog. Many of the most profound contributions of survey archaeology stem from the assumption that changing social practices will be reflected in their material and spatial proxies. When patterns on the ground change, something must have happened to induce the reordering of social, political, and economic relationships that necessitated corresponding changes in where and how people lived. This framework makes survey archaeology a dynamic and flexible tool that is able to contribute to new questions and new theoretical concerns. For scholarship of the Roman empire, the relationship between people and the landscape has never been more critical. New research emphasizes the role of space and spatial practices in establishing new political relationships — a topic right at home in the context of expanding Roman political hegemony throughout the Mediterranean and beyond. Identifying how and where the Roman political and economic apparatus intersected with local populations, and in which ways this resulted in any kind of noticeable change, remains hugely significant for understanding how the empire operated at its basic level. Moreover, imperial things, such as quarries, mines, and monuments, become significant not just as indicators of political change, but as the potential means by which the empire constituted itself in its vast territorial expanse. Such things also reconfigure social and political realities through spatial practices. 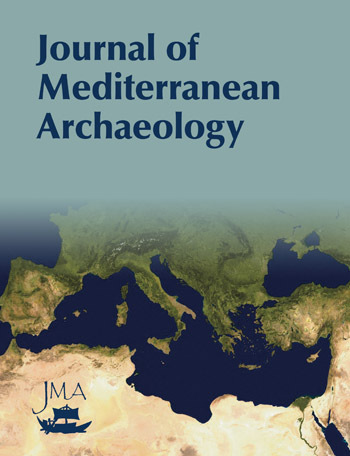 This paper addresses Roman imperial expansion in the eastern Mediterranean through the application of survey archaeology to industrial zones. The author focuses on industrial landscapes surrounding marble quarries in Greece and Asia Minor to assess how an imperial presence had an effect on settlement dynamics. These settlement trends are compared to settlement data in non-industrial regions to suggest that survey archaeology can provide insight into the methods by which the Roman empire spread, noting variation over time and across space. Sylvian Fachard was a Swiss National Science Foundation Senior Research Associate at the University of Geneva, and he has recently been appointed Andrew W. Mellon Professor of Classical Studies at the American School of Classical Studies in Athens. He co-directs the Mazi Archaeological Project in northwestern Attica, Greece and has directed excavation and publication projects in Eretria and in Argos. His monograph La défense du territoire. Etude de la chóra et de ses fortifications, Eretria (In Folio, 2012) was awarded the Georges Perrot Medal from the Académie des Inscriptions et Belles-Lettres de l’Institut de France. While touring the province of Achaia in the second century AD, Pausanias crossed and described dozens of political borders dividing Greek poleis. This may seem trivial, but no other Greek author dedicates such attention to the position and nature of political limits. In this paper, the author establishes a catalog of 60 borders recorded by Pausanias, mapping and categorizing each border-crossing according to its type and nature. The examination of the evidence shows that Pausanias’ attention and sensitivity for borders do not only betray a personal interest, but also a historical, topographical, geographical, and, perhaps more importantly, a geopolitical one as well. It also suggests that the Greek polis remained an important and recognized territorial cell in the world system of the Roman empire and that the borders of poleis continued to play a significant role. Moreover, the author argues that Pausanias should be held as an essential source for understanding how the polis, as a regional political entity braced by centuries of peer polity interaction, responded to the macro-geographical phenomenon of ‘global’ Roman ascendancy throughout the Mediterranean. Alexander Smith is an Instructor at the College at Brockport’s Anthropology Department and Delta College, as well as in the Art & Art History Department at the University of Rochester, New York. He has worked on Menorca since 2007, studying the indigenous Talayotic culture of the island, and since 2013 he has also worked on Sardinia as a survey and GIS specialist at the prehistoric, Nuragic site of S’Urachi. He works closely with the Memorial Art Gallery of Rochester, NY, promoting classroom integration of museum resources and public archaeology. Archaeological approaches to the megalithic traditions of the western Mediterranean are frequently predicated on a social evolutionist understanding of cultural progression that is as teleological as it is pessimistic, implying the corruption or wholesale loss of ‘pure’ indigenous island culture due to external forces. Yet megalithic monuments on the western Mediterranean islands did not simply cease to exist at the end of their notional cultural timeframes; many, if not most, remained occupied or at least in some form of use well after the periods historically associated with their construction and use. Taking our cue from Cherry’s (1981) insistence that, in order to understand the earliest colonization phases of islands, the archaeological evidence needs to be carefully and critically considered in relation to the specific circumstances of each island, we shift attention toward the afterlife of monuments on the western Mediterranean islands of Sardinia and Menorca. 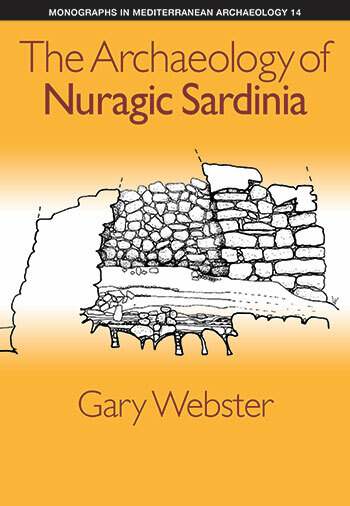 Using detailed case studies from the Nuragic site of S’Urachi on Sardinia and the Talayotic site of Torre d’en Galmés on Menorca, we consider the microhistories of these sites in order to understand better their changing use and perceived afterlife. Exploring the manner in which indigenous and colonial customs can shape their meaning is a step toward understanding the complexity and social construction of island traditions — not as points along an monolithic indigenous or colonial timeline, but from a microhistoric perspective concerning the forces of cultural change and modification in the wake of changing communal worldviews. Cyprian Broodbank is Disney Professor of Archaeology at the University of Cambridge, where he is also Head of the Division of Archaeology and Director of the McDonald Institute for Archaeological Research. He codirects the Kythera Island Project, and is author of An Island Archaeology of the Early Cyclades (Cambridge University Press, 2000) and The Making of the Middle Sea: A History of the Mediterranean from the Beginning to the Emergence of the Classical World (Thames and Hudson, 2013). Island archaeology is now a well-established field, but within the changing conditions of the twenty-first century AD, within and beyond archaeology, how can it best ensure its continued wider appeal and relevance? Three mutually compatible and far from exclusive responses are advanced here. The first emphasizes the intrinsic importance of understanding early island societies, both for the politics of identity among islanders today, and in order to contextualize the challenges they face in terms of current and future geopolitics and global warming. The second concerns the comparative insights into wider sociopolitical developments that we might gain from island archaeology, and suggests that this investigation requires a revision of questions if it is to prosper. The third argues for a new approach and agenda that explores the impact of island societies on deep global history. Preliminary indications suggest that with regard to the islands of the world’s three great oceans this is a relatively recent phenomenon, a millennium or less in age, with the possible exception of Indian Ocean transfers. Deeper time antecedents exist among some of the world’s inner seas, specifically exemplified from at least 5,000 years ago in the Mediterranean. Yet even amongst other such theaters there seems to be significant variation both in the roles played by islanders and the cultural dynamics of insularity, variation not entirely explained by differential surviving evidence. This prompts some final observations on the unusual dynamics of insularity that Mediterranean conditions encouraged, the extent to which approaches to islands first developed there as long ago as this region’s Bronze and Iron Ages became cumulatively globalized after AD 1492, and the consequent potential for a more historicized approach to comparative island archaeology. Scott M. Fitzpatrick is Professor in the Department of Anthropology at the University of Oregon. He is an archaeologist who specializes in the prehistory and historical ecology of island and coastal regions, particularly the Pacific and Caribbean. Much of his research focuses on colonization events, seafaring strategies, adaptations to smaller islands, exchange systems, chronometric techniques, and human impacts on ancient environments. He has published several books and more than 100 journal articles and book chapters, and is the founder and Co-Editor of the Journal of Island and Coastal Archaeology, an Associate Editor for Archaeology in Oceania, and serves on the editorial boards for the Caribbean Journal of Science and Journal of Archaeological Science: Reports. The sub-field of island archaeology developed primarily as an outgrowth, with strong anthropological influence, of biogeographical principles that emerged more than 50 years ago. Island archaeology has since matured and been enriched with the addition of many other areas of study, including palaeoecology, history, and biology, all of which have provided much stronger methodological and theoretical foundations for examining how and when humans occupied and adapted to island environments prehistorically. In this chapter, I examine the scholarly tradition and relevance of island archaeology in modern archaeological discourse, arguing that a comparative framework both within and between island regions is not only critical but essential if we are truly to provide meaningful explanations for how modern human behavior evolved across time and space. While there have been past attempts to cross-cut disciplinary and geographical boundaries to achieve this goal, a comparative approach is, despite its intrinsic necessity, rare; all the more concerning, as avoiding comparison risks a degree of intellectual insularity and a blinkered understanding of human-environmental interactions. This chapter provides an overview of established and emergent archaeological reconnaissance methods in the Caribbean Lesser Antilles during the historic period. The involvement of systematic survey techniques in the study of historic landscapes is not currently a fundamental component of archaeological practice across the region. In places where it is applied, methodological approaches and objectives vary considerably, and are often tailored to accommodate particular insular environments, colonial histories, or heritage preservation initiatives. The relatively few existing examples of multi-method landscape survey succeed in shifting research perspectives from a focus on the high-visibility industrial remains of individual plantation estates to wider landscapes of production and exploitation, viewed comparatively and regionally. In broadening the horizons of Caribbean historical archaeology, these pioneering landscape-based studies raise issues that demand further attention, most notably, those of scale and the comparability of survey data between islands. Thomas G. Garrison is Assistant Professor of Anthropology at Ithaca College. His research focuses on the archaeology of the ancient Maya civilization and remote sensing application in archaeology. He currently directs the Proyecto Arqueológico El Zotz, in Guatemala, as well as the Maya Aerial Technology Survey. He is co-author of Temple of the Night Sun: A Royal Tomb at El Diablo, Guatemala (Mesoweb Press, 2015), and has recently published articles on Maya settlement patterns, human-environmental interaction, and remote sensing in Advances in Archaeological Practice, Journal of Field Archaeology, Journal of Archaeological Science, International Journal of Remote Sensing, and Latin American Antiquity. The concept of peer polity interaction resonated with Mesoamerican scholars because of the apparent applicability of the idea to the Maya and other New World civilizations. New revelations regarding the Maya since the 1980s, provided by the near total decipherment of their writing system and a wealth of paleoenvironmental data, suggest that a new model, inspired by peer polity interaction, is appropriate. This chapter proposes an embedded heterarchy model that takes into account cultural and environmental data from the Maya lowlands. The model is based on a proposed analytical hierarchy derived from the spatial theoretical work of David L. Clarke in the 1970s, while the explanatory power of the model is provided by the application of concepts from landscape ecology theory. For the Maya, areas, territories, adaptive regions, and alliances constitute an analytical hierarchy that can be explained using the landscape ecology concepts of structure, function, and change. It is suggested that similar analytical hierarchies, perhaps driven by different bodies of theory, may be appropriate explanatory models in other traditional peer polity civilizations as well. Embedded heterarchies refer to the interactions between units of equal status within the overall analytical hierarchy. To explore the embedded heterarchy model, an example is given at the level of Maya alliances. The alliance concept is explored in depth and the Tikal Alliance of the southern Maya lowlands is used as a case study. This contribution hopes to meet an original goal of the peer polity interaction model of inspiring new, detailed research by providing fresh questions for debate. Christopher Witmore is Associate Professor of Archaeology and Classics at Texas Tech University. His research engages objects, land, and ecology in Greece over the very long term. Co-author of Archaeology: the Discipline of Things (2012), and co-editor of Archaeology in the Making (2013), he was recently the Donnelley Family Fellow at the National Humanities Center and is currently working on the book Old Lands: A Chorography of the Eastern Morea. This chapter reconsiders the notion of complexity through a condensed case study of the Argive polis. Rather than begin with a formative entity toward a particular end, it sets out the conditions that make the democratic polis possible at the beginning of the third century BC when Argive statecraft had come to be experienced as tenuous and in need of protection. Argos, moreover, is a heterogeneous assemblage that self-defines its components retroactively. Understanding the polis as a whole that exceeds the sum of its parts affords some secondary considerations regarding the emergence and endurance of such sociopolitical complexities. Ultimately, alternative definitions of both complexity and emergence are revealed by way of conclusion. Appadurai’s edited volume The Social Life of Things (1986) first sought to highlight multiple ways in which ‘things’, like people, have active social lives, even biographies. Since then, this train of thought has taken multiple turns, and gone through many diversions and amplifications to, amongst others, agency, materiality and object/material agency, the ‘cognitive life of things’, human-thing ‘entanglements’, ‘symmetrical’ archaeology and the ‘new materialisms’. The end result appears to be a sweeping critique of ‘anthropocentricity’, in which it is argued that the archaeological study of cultures need not have any reference to humans, whether agents, individuals, subjects, or collectivities, but instead must focus on the nexus amongst things. Things, then, are not just tokens or surrogates for human acts or activities, but rather act as material agents in their own right. Taking some materials from archaeometallurgy — specifically that of Bronze Age Cyprus as known from regional archaeological survey and excavation — as my point of discussion, this paper critiques the overall notion of ‘material agency’ and considers the cultural biography of metallurgical ‘things’, seeking to separate the chaff of materiality from the wheat of material culture. Camilla MacKay is a librarian who has participated in fieldwork most recently in Greece. Her research interests include medieval and post-medieval pottery and the intersection of digital and print scholarly publications, inspired in part by serving as one of the senior editors of the open access journal Bryn Mawr Classical Review. Here the author considers new methods for publishing and the evolving scholarly record as they relate to field and survey archaeology. Electronic publication in archaeology, exposing corpora of material faster and in far greater volume than printed publications, should enable rapid access to information that can promote and facilitate complex scholarly questions, especially comparison of data across sites. But challenges abound and successes are, arguably, few: electronic publication of born-digital data has often been undertaken in a way that is demonstrably unsustainable and unstable. Data can remain unused (or useless) in the absence of curation and explanation, and, crucially, the long-form narrative. In many ways digital publication of archaeological data has progressed little in recent years while traditional forms of long-form scholarship remain strong. Yet open access to these narrative publications, especially in conjunction with linking to data repositories, may help institutionalize acceptance and use of stable data repositories. This concluding chapter situates the foregoing contributions in their wider disciplinary context and offers some suggestions on how archaeologists interested in regional studies of social complexity might look forward productively. We begin with a retrospective view of points of convergence and divergence in the chapters presented in this volume, focusing in particular how they contribute to past and ongoing debates in regional archaeology and studies of social complexity. Points of convergence include examinations of the role of the physical environment and material things in social interactions, as well as critical approaches to understanding the operation and maintenance of socio-political complexity. We see more divergent patterns in how scale is addressed, explicitly or implicitly, and in how comparison is attempted. The patterns witnessed here, we argue, in general reflect wider trends in archaeological thought. Finally, we turn to the future, suggesting that increasingly accessible technological and scientific developments will continue to have profound influence on the field. The nature and long-term effects of such innovations, however, are largely unpredictable. Rather than pointing toward unknown achievements of the future, we stress that the most valuable developments in this field moving forward concern methodological transparency, theoretical flexibility, and a critical, measured, and broadly engaged attitude toward collaboration, comparison, and disciplinary crossover. Jack L. Davis is Carl W. Blegen Professor of Greek Archaeology in the Department of Classics at the University of Cincinnati, and is former Director of the American School of Classical Studies at Athens. He has directed regional archaeological survey projects in Greece on Keos, in the Nemea Valley, and Messenia, as well as excavations and regional studies in Albania. He currently co-directs excavations at the Palace of Nestor at Pylos. His recent books include Between Venice and Istanbul: Colonial Landscapes in Early Modern Greece (American School of Classical Studies at Athens, 2007) and Philhellenism, Philanthropy, or Political Convenience(American School of Classical Studies at Athens, 2013). All the papers here have benefitted from the lucidity and the reflexive attention to method which Cherry has consistently applied and promoted. It is because this volume exemplifies those qualities so effectively, as well as advocating them so coherently, that it will become a landmark publication in the advocacy of good, theoretically robust archaeology, with a respectful approach to the collection and analysis of data. A high-quality publication that contains some interesting and insightful papers. Cherry' s career-long emphasis on a comparative approach combined with the work of the editors brings some coherence to the plethora of places and periods touched upon in the individual chapters, and the Introduction and conclusions draw out over-arching themes well. It is certainly a fitting tribute to a sparkling career.